Sad and glad. We’re sad to announce that City Soul Choir’s beloved music director, Brian Tate, is moving on after 10 years. Brian and Patricia, who co-founded the CSC in January 2010, have long wished to live in a quieter city, and moved to Victoria last fall. Brian will conduct his last CSC concert 'People Get Ready!' on Saturday, May 11th. The choir is sad to see Brian go, but glad that he loves his new home. The CSC is also glad that another beloved Vancouver musician/choral director, Karla Mundy, will be taking Brian’s place at the helm for the Fall 2019 term. Life moves us all forward and brings inevitable change and new adventures! We all know Brian is a treasure. He is passionate about music and knows how to bring out the best in a choir. His quick wit, humour, interpersonal and musical skills lighten every rehearsal and performance. He inspires us all and will be dearly missed. Don’t miss our farewell concert with Brian on May 11. It’s going to be a special evening indeed! 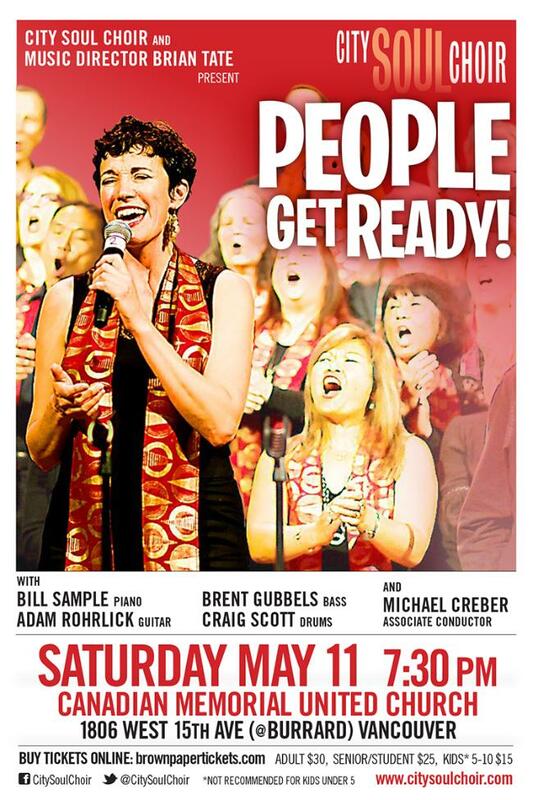 The City Soul Choir is thrilled to present its 10th annual spring concert! People Get Ready will include often-requested CSC favourites from the past 10 years, along with some beautiful new songs. We are pleased to present a familiar face in a new role—our wonderful pianist, Michael Creber, is taking on the role of associate conductor this term, and you’ll see him conducting three pieces. One is a powerful song from the civil rights movement, the 1965 Curtis Mayfield classic, People Get Ready. Today, it’s troubling to see how little progress has been made in many areas of social justice. More than ever, we need to rally and fight for freedom and equality for all. It is said that Martin Luther King Jr. declared People Get Ready an anthem of the ongoing civil rights movement. Music helps drive that movement. So, people get ready, get on board, there’s a train a-comin’! Ticket sales begin at 9 AM March 30 on Brown Paper Tickets. 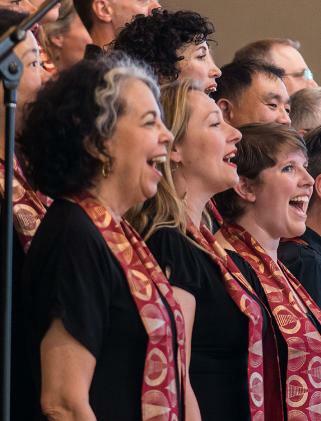 When City Soul Choir sings, an earth-shaking vibration of joy hits the listener. The power and energy of this group of talented musicians is very heavy. What a great evening! Recently, I heard the City Soul Choir, conducted by Brian Tate, in a concert of songs that was both moving and a joy to hear! Brian and Patricia Tate have created in the City Soul Choir one of the most exciting musical programs Vancouver has to offer. The City Soul Choir has the power to draw you in close. Under the masterful direction of Brian Tate, everyday people find their extraordinary voices, and what a pleasure that is to behold. Want a taste of City Soul Choir's soul, gospel, world grooves? Listen . . .